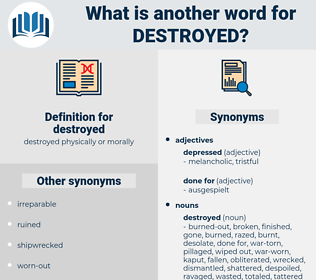 What is another word for destroyed? broken, destructive, damaging, disastrous, damaged. breaks, uses, USS, TBS, destruction, destructive, destroyer, damaged. destabilized, Eradicated, removed, eliminate, Eliminated, Eliminating, Deleted, disrupted, sabotaged, Erased, eroded, deprived, depleted, Toppled, ordered, Jeopardized, undermined, uprooted, Wiped, lost, rippedthrough, Invaded, terminated, declared, Denied, Suffered, exploded, collapsed, Wreaked, tore, consumed, dynamited, Abolished, Massacred, Died, struck, disemboweled, Caused, Raided, vandalized, violated, executed, cancelled, broke, affected, surprised, Stormed, hurt, Butchered, Blew, Knocked, murdered, blasted, ruled, Trashed, swept, ended, spoiled, burned, maim, decided, Sank, spent, breached, breaches, Was, Were, Resulted, Attacked, Came, dropped, buried, wasted, Screened, left, striped, kiiled, private, Brought, justice, cleared, exhausted, impacted, Culled, HIT, Sentenced, Leveled, ripped, branded, led, totaled, Awarded, Snapped, finished, fell, Plunged, busted, downed, Took, 'd, Did, Had, kicked, Got, devastated, wrecked. Eradicated, Deteriorated, removed, Eliminated, redeployed, depressed, delete, Deleted, exterminated, Decimated, assassinated, disrupted, Derailed, stopped, sabotaged, dismantled, endangered, decommissioned, evaporated, Disappeared, Erased, surrendered, degradation, eroded, rid, suppressed, jeopardised, depleted, defeated, distorted, threatened, Slaughtered, Toppled, conquered, Banished, ordered, Jeopardized, Liquidated, undermined, Overridden, disposed, discontinued, withdrawn, Wiped, Sacrificed, dissolved, extinguished, defaced, lost, worsened, addressed, decomposed, Delivered, overturned, Survived, roster, overcome, terminated, weapons, offset, diminished, Counteracted, thwarted, squandered, stifled, Extirpated, corrupted, confused, negated, exploded, seized, abandoned, collapsed, harmed, severed, injured, torn, rejected, Avoided, stricken, discarded, Excluded, tarnished, pulverized, Bulldozed, shot, modified, crushed, Transferred, impaired, disturbed, slain, dead, consumed, completed, condemned, Aborted, Abolished, interrupted, clobbered, Captured, solved, Died, decayed, struck, Caused, dequeued, chaos, implemented, vandalized, Harvested, violated, Voided, reversed, selected, executed, cancelled, Hampered, vaporized, weakened, bombed, undone, Excreted, blown, upset, resolved, affected, troubled, hurt, reduced, murdered, chosen, ravaged, restricted, ransacked, doomed, blast, perturbed, settled, nullified, Appeared, moved, routed, spoilt, Compromised, Trashed, Arrived, swept, ended, burnt, afflicted, used, concerned, burned, Performed, sunk, retired, Repealed, Disbanded, Been, shaken, come, breached, Remedied, Entered, flattened, shut, touched, dropped, Annulled, Prevailed, scrapped, wasted, Screened, Purged, left, vanished, vitiated, kiiled, retained, sprayed, phased, Waived, plagued, laid, lifted, clouded, fractured, Judged, misplaced, blighted, shocked, cleared, bereaved, convicted, impacted, failed, Culled, HIT, Levelled, changed, Lived, Sentenced, ripped, dashed, Aimed, missed, maintained, Logged, banned, Launched, skinned, Snapped, finished, Carried, Happened, fallen, nil, gone, marred, downed, felled, #, taken, controlled, arms, gunned, done, have, won, Claimed, Gotten, cut, devastated, broken. Killed, shot, flattened, shattered, damaged. intact, restored, successful, saved, protected, sober, repaired, fixed. kept up, well-kept, maintained, conserved, preservable, retained. found, kept, unbroken, unfinished, won. Your house would be destroyed before you knew there was any danger!" Storm has not destroyed the parish, as I feared he would. distort, dish the dirt, dexterity, distrait, dastard, dogtrot, dog-tired, distorted, doctorate, Dutch Treat.